Welcome to the Adventures in my Kitchen!!! I am so glad to see that you have clicked that "follow" button, and am super thrilled that some of you are now following me on Pinterest and Instagram, too! I hope you enjoy my little site and we become the bestest of invisible internet friends! I am working on some supremely scrumptious stuff, but you're just going to have to wait there on the edge of your seats for a bit longer. In the meantime, please drool over this picture. 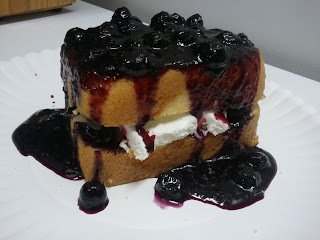 I poured hot blueberry syrup over angel food cake stuffed with whipped cream for dessert. Mmm, mmm, tasty! I'm hosting a giveaway over at my blog too, would love for you to enter! I started drooling just looking at this. Looks and sounds soooo yummy. Hope you can stop by and enter the Labor Day Giveaway I'm hosting.